24 November 2016, at 12:00a.m. US - When we keep setting new weekly slaughter records, hog prices are going to have a difficult time moving higher. Last week was the second largest weekly slaughter ever. I believe that we could experience the top 10 largest weekly kills in the 4th quarter of this year, writes Allan Bentley, Genesus. As so many people have talked about, the cutout values are at record levels as compared to live hogs, and packers are making record profits. When slaughter numbers fall into next spring we should recover cash hog prices, as those packers have plenty of margin room to compete with each other. Until then, we are going to struggle. No one is needing extra pigs, and even the niche markets are turning them away. The good news is feed cost are at levels we have not seen in a while. I do not see corn heading higher until next summer and that will take a weather scare. People are pointing to an increase in corn and bean exports as a sign that grains will move higher. I think what we are seeing is nothing more than front end loading. Foreign customers are getting products bought up before the dollar rises. The Feds have all but promised raising interest rate in December, which should increase the dollar’s value. If Trump follows through with his campaign promises, we should see massive deregulation. That should keep oil under $50 a barrel, so corn will likely fight to get much above $4.00, with a barrel of oil at those prices. All this points to corn markets that will remain sluggish. Of course, pork exports are going to be at the mercy of many of the same scenarios. 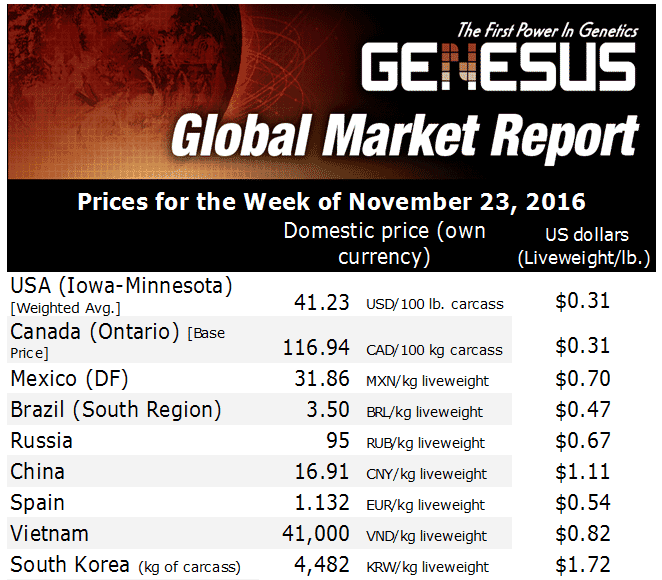 Another issue with a stronger dollar is that Canadian imports of pigs to the US will very likely increase.